The genre-defying maverick has also stormed the UK singles charts with three tracks from the album (the maximum number allowed by new chart rules) making the Top 20 today. On Post Malone’s home turf in the US, where he is signed to Republic, Beerbongs & Bentleys went platinum in just four days and has smashed first day streaming records on Spotify with 79m global streams. Island have focused much of their marketing online and rolled out an interactive “if you were Post Malone, what would your album name be?” feature alongside plastering outdoor billboards and posters across London. Beerbongs And Bentleys represents yet another creative breakthrough for the 22-year-old since the success of his 2016 Top 10 album Stoney.The track listing includes the four-week chart-topper rockstar as well as current Top 10 hit Psycho. 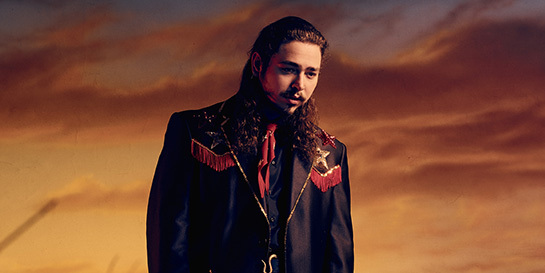 Island will be welcoming Post Malone to the UK for Wireless Festival on Friday July 6 and Reading and Leeds on Friday August 24.